Cheetah mobiles had launched a new free voice calling app called WhatsCall last year (October). Within four months, the app has reached a great milestone of a million users. The app enables you to make local and international calls for free. Is this application reliable? Is it safe and user-friendly? Let’s find it out. Download the application from the Google Play Store. After its installation, run the app by tapping on its home screen icon. WhatsCall app will now ask you to verify your phone number. Enter the mobile number and tap on the OK button. After a few seconds, your mobile phone will receive a text message with a numerical verification code. Enter the verification code as it is and tap on the done button. Now the WhatsCall app will prompt you to enter a password. Once your password has been accepted by the app’s server, WhatsCall will ask you to enter your name. After you enter the name, select the OK option to begin using the WhatsCall Android app. WhatsCall will now try to read your contact list. Like the top navigation apps, it also reads your location. The app reads your contacts because it comes with a phone dialer interface and it determines the location so as to know the user’s country code. 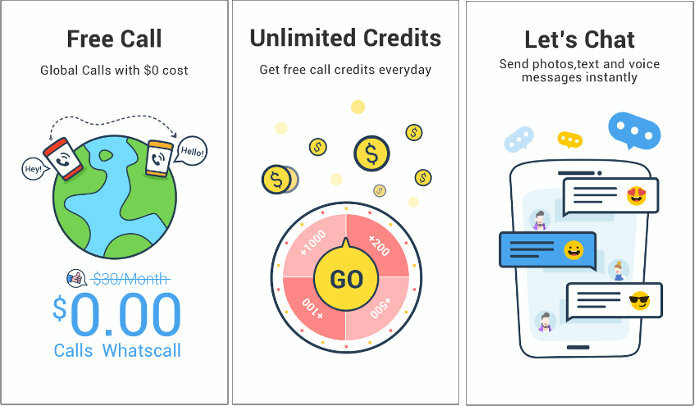 The app rewards you with 1000 call credits for creating a new account. If you want more credits, complete the tasks the app puts forward you. Making free calls with the WhatCall app from Cheetah mobiles is easy. All you have to do is open the main interface of the app and tap on the call icon located on the WhatsCall’s toolbar (bottom of the main window). Once you do so, WC app will show a list of recently dialed numbers and an option to select a country code. Select a number from the list and choose your country. Now, WhatsCall will show a small popup window. The Window flaunts a blue color button, the current time, phone number and the country. Tap on the button. WhatsCall will now dial the number you’ve chosen. The received will see a different number instead of your phone number. Once the application establishes a call, you can begin talking with the person. Apart from allowing you to make free calls, the WhatsCall application from CM lets you send free text messages to the numbers saved on your phone for free. It has a special feature called Moments that lets you upload images on WhatsCall. The app has a contact manager interface through which you can add a new contact. It has a search module that enables you to find a specific contact from the list. The interface has a text field to search caller IDs. Call, notification, notification bar settings. Caller ID, account security, privacy and blacklist settings. Note: The WhatCall app will not work if you don’t give it permission to make phone calls and record audio. To assign these two permissions, navigate to the Android permission manager module. WhatsCall is a nice application that allows you to make voice calls to a person residing in your country or in a foreign country. It has a simple UI and works as per your expectations.